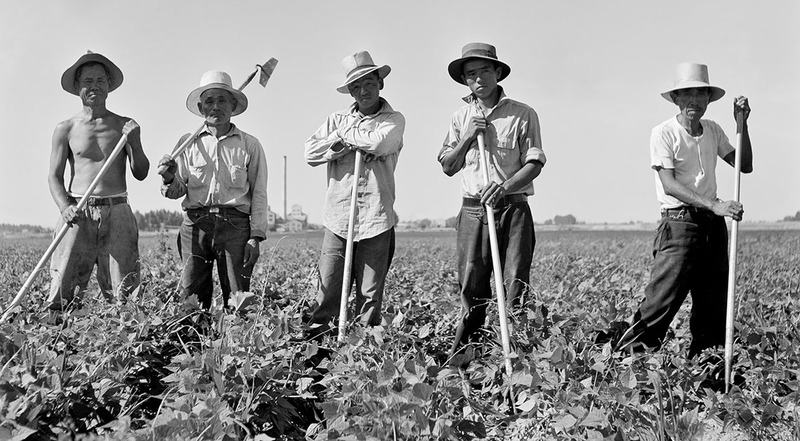 Laborers in sugar beet fields outside of Shelley, Idaho (detail). Library of Congress, Prints & Photographs Division, FSA-OWI Collection, LC-USF34-073809-E. Between 1942 and 1944, thousands of incarcerated Japanese Americans were moved from assembly centers and concentration camps to farm labor camps as a way to mitigate the wartime labor shortage. Some 33,000 individual contracts were issued for seasonal farm labor, with many Japanese Americans assigned to work in the sugar beet industry, which played a vital role in producing munitions for the military. Under this seasonal leave program, Japanese Americans could earn better wages while contributing to the war effort. 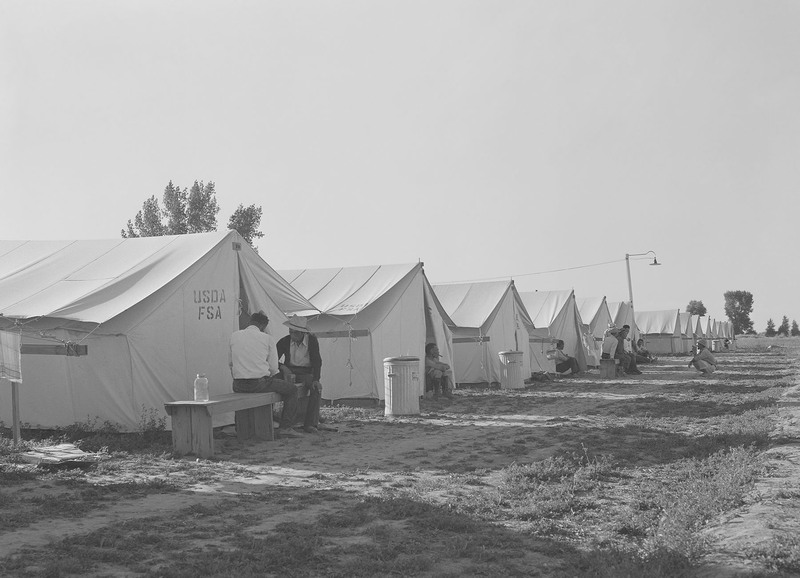 In the summer of 1942, Farm Security Administration (FSA) photographer Russell Lee visited four Japanese American farm labor camps located near the towns of Nyssa, Oregon; and Rupert, Shelley, and Twin Falls, Idaho. He captured the laborers’ day-to-day lives in evocative detail, producing rare images of a little-documented episode of American history. Lee also recorded the forced removal of individuals and families in California, taking a total of nearly 600 photographs of the Japanese American wartime experience. According to his biographer, F. Jack Hurley, Lee abhorred the government’s treatment of Japanese Americans during the war and wanted to document what he described as a very dark period in American history. Uprooted: Japanese American Farm Labor Camps During World War II showcases a selection of Lee’s farm labor camp photographs accompanied by his original captions. Many of these images have never before been exhibited. The exhibition also includes a short documentary film featuring firsthand accounts of life in the camps. An extensive website at uprootedexhibit.com provides materials for further study, including photographs not in the exhibition, historic documents, video clips, transcripts from oral history interviews, and lesson plans. Uprooted seeks to contextualize Lee’s images within the history of the FSA as well as Japanese American camp life in the two states. From 1935 to 1944, the FSA’s renowned documentary photography program produced approximately 175,000 black-and-white film negatives and 1,600 color images. Trained as a chemical engineer, Russell Lee joined Roy Stryker’s staff of FSA photographers in 1936. He continued to work for the New Deal agency until 1943. Lee was by far the most prolific of the agency’s photographers, producing more than 5,000 images in less than seven years. Perhaps best known for his series on Pie Town, New Mexico, Lee photographed across the United States. This exhibition was organized by the Oregon Cultural Heritage Commission (OCHC) and funded, in part, by grants from the US Department of the Interior, National Park Service, Japanese American Confinement Sites Grant Program; the Idaho Humanities Council, a State-based program of the National Endowment for the Humanities; Fred W. Fields Fund of the Oregon Community Foundation; the Rose E. Tucker Charitable Trust; and the Malheur County Cultural Trust. The farm labor camp outside of Shelley, Idaho. Library of Congress, Prints & Photographs Division, FSA-OWI Collection, LC-USF34-073778-D.
© 2016 Japanese American National Museum. 100 N. Central Ave., Los Angeles, CA 90012. 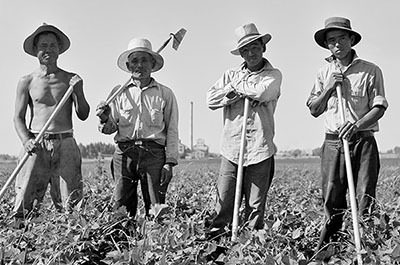 Top: Laborers in sugar beet fields outside of Shelley, Idaho (detail). Library of Congress, Prints & Photographs Division, FSA-OWI Collection, LC-USF34-073809-E.